Major General Asim Saleem Bajwa was commissioned in Punjab Regiment from Pakistan Military Academy Kakul in March 1984 in 34 Punjab Regiment. He has held various Command, staff and instructional appointments that include Command of an Anti Tank Battalion, an Infantry Brigade Group and a strike Infantry Division. He has been Brigade Major of an Infantry Brigade and Chief of Staff of a strike Corps. He has also been on the faculty of PMA Kakul and Command and Staff College Quetta. He has served as deputy Military Secretary to the President of Pakistan. Graduate of Command and Staff College Quetta, National Defence University and Staff College Camberley (UK), he also holds Master degree in Defence Studies from Kings College London (UK) and MSc War Studies from NDU, Islamabad. He is recipient of Tamgha-i-Basalat. 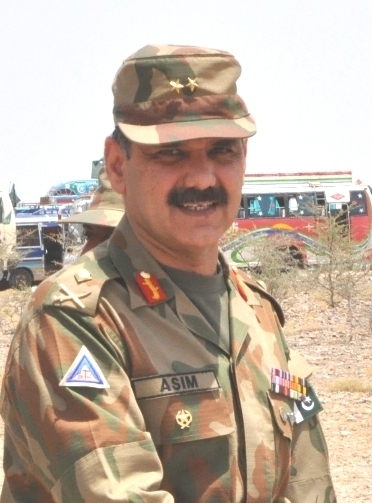 He will assume the charge of Director General Inter Services Public Relations (ISPR) on 4th June 2012. This entry was posted in ISPR Press Releases, News and tagged Army, DG ISPR, ISPR, Major General Asim Saleem Bajwa, Pak Army, Pakistan Army, PR. Bookmark the permalink.